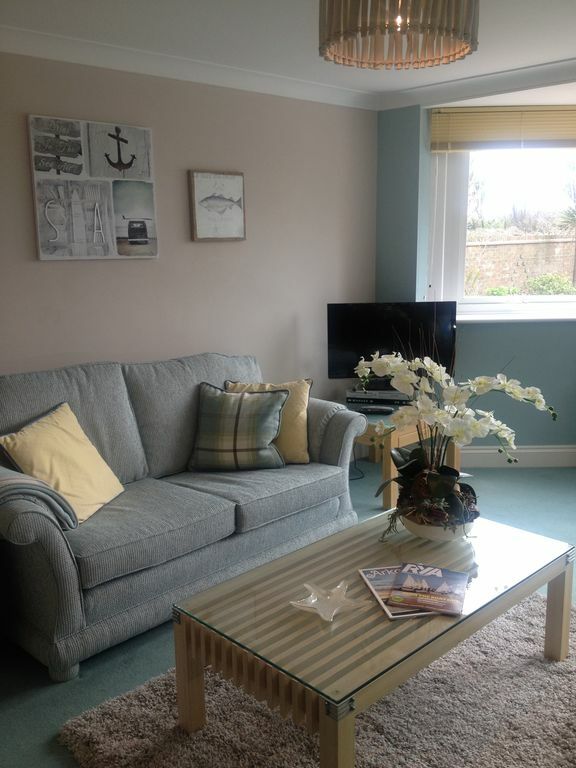 South facing, with sea views, own entrance lovely one bedroom apartment, large lounge breakfast bar and bathroom. Outside patio with table chairs, sun loungers and Barbecue. Private parking. Just a stroll across to the beach with open views of the Isle of Wight and the Needles. Walk into our friendly picturesque village and further to the salt marches at Keyhaven and along Hurst spit. Or walk through our lovely woodland areas along Danestream. If you have more energy than us Christchurch and Bournemouth are just 15/30 minutes away by car, with shopping, busy beaches and trendy bars and night clubs. We are Bob and Linda and have lived in Milford-on-Sea for 14 years. We love the views of the Isle of Wight and the Needles with the ever changing sea from our house. It is a joy to wake up to everyday, we love walking along the beach in all weathers. We have both been welcomed into the community and are involved in the many village events, food week, music week,choir and theatre.We enjoy the many restaurants, pubs and socialising with our lovely friends we have made here. We also enjoy great sailing here on the Solent. Our sons and their family's live a few minutes away and we love spending time with them and our two gorgeous granddaughters, What a lovely protected area for the girls to grow in. Our light airy south facing one bedroom apartment has just been refurbished. It has its own private entrance and safe car parking to the rear. The apartment comprises of a large lounge with wi-fi, flat screen TV, DVD, CD player and radio, Its open plan to the fully equipped kitchen with halogen hob, electric oven, microwave, fridge, kettle and toaster. All the crockery, cutlery, utensils, glasses, pots and pans that you could need are here. There are two high stools at the breakfast bar. The bathroom is brand new with a bath, shower over, heated towel rail and underfloor heating. The large comfortable double bedroom faces south and has a built in wardrobe with an iron and ironing board and hair drier for your use. Outside you have a private patio area with a table and two chairs, two sun lounges and a BBQ for your ideal holiday. The apartment sleeps two, we could provide a travel cot for a baby or toddler. We offer a welcome pack if you require one. Milford-on-Sea has everything to offer the holidaymaker. A beautiful coast line for walking, views of the Isle of Wight and the Needles with its light house. A shingle beach for safe swimming and wind surfing . With a low cliff face which pushes the sea breeze up, you occasionally see a para glider drifting along the cliff top from Milford to Highcliffe. Take a 10 minute walk into the village which has gained a foodie reputation with several really good restaurants. A renowned fish restaurant, a Thai, a French an Indian and a trendy pizza restaurant. Plus several pubs, coffee shops and a great wine bar. If you are planning self catering we have two small supermarkets with fresh bread baked daily, a greengrocers, a delicatessen, fresh wet fish shop caught on the day, and an award winning butcher all situated around our village green. A further ten minute walk will take you to Keyhaven and the salt marshes,ideal for bird watching.The village has its own hide situated on the edge of Stuart pond where many visiting birds feed. Or you could walk along the 1.5 mile shingle spit to the Hurst castle built in 1544 by Henry the IIIV. Too energetic then take the ferry from Keyhaven to the castle gates or onto Yarmouth on the Isle of Wight, with its lovely pubs and restaurants and great walks. Lymington is a bustling Georgian town a 10 minute drive away with many shops and a popular Saturday market, with two large marinas and quayside moorings it is a mecca for the sailing fraternity Sit on the quay and enjoy fish and chips or just have a New Forest ice cream made in the town and enjoy the view. All of this just a short drive to the New Forest itself with its wild horses, ponies and loveable donkeys just roaming around without a care in the world. Christchurch with its Abbey and rivers, or Bournemouth with its award winning beaches and fabulous shops, and of course its great night life are just 15/30 minutes away. Modern bathroom. L shaped bath with shower over. Basin and toilet. Heated floor and towel rail. We also have a travel cot to accommodate children up to and age. Thanks very much for a very pleasant stay! Thank you for your'e kind review. I hope you found some really nice walks and cycle tracks. Clean, comfortable, cosy accommodation that was ideal for a short break away. A very good location only a short walk into the local village that has plenty of extremely good eateries. Clifftop walks from right the doorstep and only a short drive into the middle of the New Forest, it is a highly recommended place to stay. Hosts were so friendly and helpful, we very much enjoyed our stay. Huge thumbs up all round! Nothing is better than welcoming back previous guests.We are so happy you both enjoyed your stay. Kind regards Robert and Linda. A lovely stay, thank you, a lovely place too and very comfortable. Perfect location with the coast just over the road and marvellous views and walks. Restaurant, pubs and cafe's all with easy walking distance and of great quality. The only comment really is that more cooking pans with lids and a casserole dish would have been helpful. Would definitely re-visit. Robert and Linda are very friendly and their welcome was very helpful. I would like to say how lovely it is to know you enjoyed your stay with us. We found the cooking pot lids in the colander at the back of the pot cupboard. Linda has now bought a larger casserole dish for use in the future. We think we are very lucky to have moved to Milford some 17 years ago, and are able to share what we have here on offer with our guests. To know you enjoyed it too is wonderful. Sorry we missed you on your departure, and hope you had a pleasant journey home. Thank you for your lovely review. How lucky you were with the great weather, We love to here our guests enjoy the area we live in and love sharing it with you. Looking at the guestbook you both visited some great places. It was lovely having you here, take care, Kind regards Robert and Linda. This really is the perfect place for a great break away. The apartment was beautifully decorated, and very cosy. Plenty to see and do in the local area. Country pubs within walking distance. The sea was across the road, with little pathways for strolling. Definitely would like to go back. Highly recommend.